Can literary writers do genre? Many people think not. A literary writer will get bored with the conventions, they say, and begin experimenting, producing a pulp/literary hybrid. Recent history shows many examples of this: Michael Chabon won a rash of prizes for his detective novel The Yiddish Policeman’s Union, and New Fabulists like George Saunders, Manuel Gonzales, and Karen Russell embrace and explore the conventions of fantasy and science fiction. But what about the pure genre novel? Is it really off-limits to literary writers? T. J. Danko is the pseudonym of a literary writer who has published stories in various journals, but his latest work embraces one of the most popular forms of genre literature—zombies. The Dead We Know is not a Chabon-like crossover or a Saunders-esque ironic treatment. It’s old-fashioned page-turner that keeps you up after your bedtime. 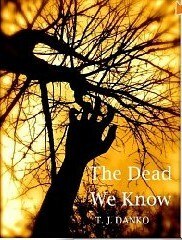 You can read the first chapter of The Dead We Know here. He closed his eyes and began to drift off. Eduardo punched him. “Fantastic,” Eduardo said. He switched on the radio, and there was a sharp crackle. He kept turning the dial, but there was only more noise. The scene’s realism—Nick and Eduardo behave like every road-tripper who’s ever lived—is what heightens the tension. Through a realistic argument, we’re being told, indirectly, everything that will happen. Of course they will crash, and of course the crash will happen in the dark, in the middle of nowhere. This is a zombie novel, after all. It might be tempting, as a writer, to “reinvent” the genre, but the best genre novels stick to conventions. The writer’s skill is in making those conventions seem fresh and new. One way to do this is to avoid giving the reader information directly. Instead, focus on the characters, the ways their personalities clash. Give the characters lives that exist prior to the zombies. In other words, give the characters something to talk about, and then let the story intrude. Let’s play around with dialogue. For this exercise, write a scene (two pages max) in which you use only dialogue. Choose a setting (exiting a movie theater, approaching a rope bridge over a lava flow with pterodactyls flying everywhere). Choose a relationship dynamic (they’re fighting over…, they’re upset because…, they’re relaxed because…). Now write the scene. But here are the rules: The characters cannot state outright the relationship dynamic or the goal. They must allude to or approach the dynamic/goal from an angle or under cover of some other piece of conversation. These rules may seem difficult, yet you may discover that your scene begins to move in unexpected ways. Try it out.